Tel-Aviv Gay Pride festival may secure long, lasting, self-sustaining peace in the middle-east! Scoof: Sources close to the negotiations say agreement will be initialled within a couple of days, and "high impact aggression" in Gaza would start no sooner than 10 days after the end of festival events. The planned extension of the festival over June-July-August will secure long, lasting, self-sustained peace in the middle-east. 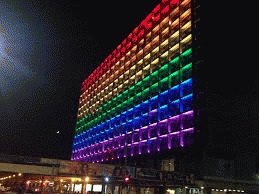 Tel-Aviv city hall Gay Pride festival lighting. OccupyTLV, May 29 -- with the official opening today of the month-long Tel-Aviv gay pride festival, a major feature on the international LGBT scene,  sources close to the secret negotiations claim that IDF/Tel-Aviv Gay Pride investors are nearing agreement on the timing of any possible/probable (depending on the source) IDF "high impact aggression" against Gaza this summer. Last year's IDF campaign in Gaza, combined with routine, false "missile alarms" in Tel-Aviv had a disastrous effect on Tel-Aviv's tourist industry during peak season. Over-priced as it is, Tel-Aviv's hotel rooms generate top prices during the Gay Pride festival... Obviously, "missile alarms" in Tel-Aviv, fake or real, would be problematic. The organizers would suffer losses, not only related to on location tourist spending, but also cancellations, demands for refunds, and what can also become a long-term legal nightmare. The investors are surely unwilling to take the risk, knowing that it is not a force majeure, but an IDF-PM Netanyahu's Security Cabinet decision. The concurrence of Gay Pride festival and another massacre in Gaza would create an PR disaster, both for the Tel-Aviv Gay Pride festival and for the State of Israel. PM Netanyahu is also reputed for his "New Economy" mindset, which is highly responsive to large-capital and business interests. Given such confluence, sources are confident that an agreement would at least be initialled within a couple of days. One remaining difference between the two sides' positions pertains to the minimal interval between the end of the Gay Pride festival events and start of "high impact aggression" in Gaza. It appears that the final agreement would fall between 10-14 days. Some observers say that the circumstances of this year's Tel-Aviv Gay Pride festival, would have caused early gay activists to roll in their graves. Others note that it may reflect main-streaming of gay pride to the point of cynical maturity. On a positive note: Further extension of the Tel-Aviv Gay Pride festival to cover June-July-August, the highest risk months of the year, will secure long, lasting, self-sustained peace in the middle-east. Anything else is just too expensive. Israelis are typically docile, apathetic bunch, but any increase in the cottage cheese price may ignite a revolution! Start-up nation made its way within a decade to #1 in poverty rate among OECD nations. 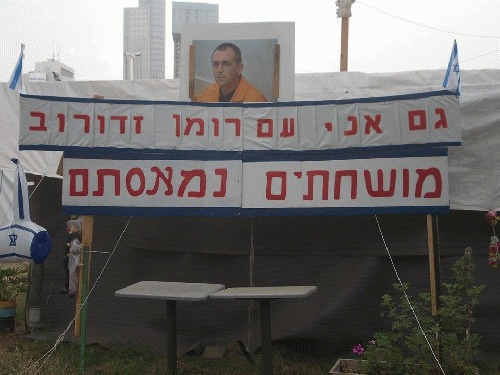 Roman Zadorov support sign at OccupyTLV - the framing, false prosecution and false life sentence of Zadorov in the 2006 murder of 14 yo Tair Rada is the flagship of corruption in the Israeli justice system today. The assassin made his way in and was hanging for a while with the bodyguards, waiting for PM Rabin in the styrile zone near the PM's limo. 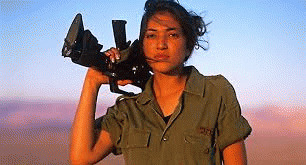 Then he managed to shoot Rabin 3 times from 0.50 meter distance and survive, when the bodyguards are trained to kill such person within 1.8 seconds. The brass circles on the floor show the location of PM Rabin, the assassin, and the bodyguards. The closest center rings are the assassin and PM Rabin, the rest are the body guards around them. "Peace and Democracy Vigil" at the assassination site. 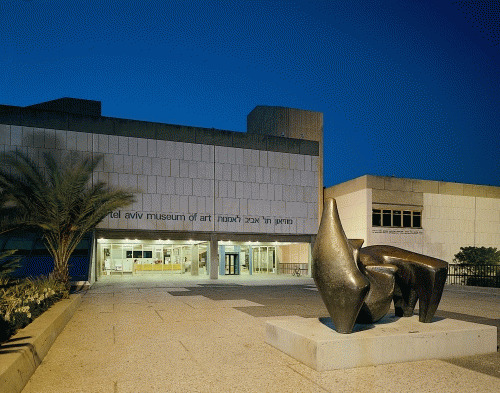 The north side of the square faces the Tel-Aviv Museum, with its beautiful façade. 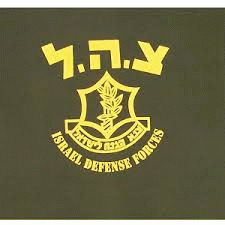 The south side faces the main gate of IDF headquarters, underground command and control bunker and its communication tower. 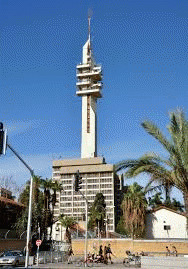 The east side faces the corrupt Tel-Aviv District Court, and the west side faces the central municipal library. Recognized as a high-energy rave site. North face is the Tel-Aviv Museum.